This page features news items from 2008. In response to several requests, we've now added a feature item detailing some of the various guitar tunings that Ant has used on different albums. This is a work-in-progress and further details will be added to it in due course. The feature can read here. 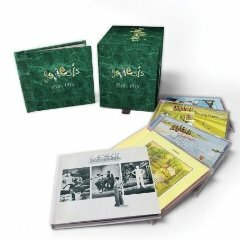 Out now is Genesis 1970-75 - the last of the three box sets of re-releases of the band's albums featuring new stereo mixes of the original albums on CD, along with a DVD that includes the original album in 5.1 DTS (96/24) and Dolby Digital Surround Sound, plus bonus videos and new interviews with band members filmed exclusively for these reissues. Ant has given an interview for the DVD of Trespass that is included in the set and a further brief clip from his interview is included on the 'Extras' DVD. The 'Extras' disc that is included with the set features Ant on a number of tracks including four previously unreleased recordings from a 1970 session that Genesis recorded for potential use on a BBC TV programme about painter Mick Jackson. The third track from this session ('Manipulation') is a group version of Ant and Mike Rutherford's co-written piece F Sharp (which may be familiar from the original 1969 demo version included on Archive Collection Volume One) that later formed the basis of part of The Musical Box. Also from 1970 are three songs recorded by the band in session for the BBC Radio programme Night Ride (Shepherd, Pacidy and Let Us Now Make Love) along with the 1969 demo of Going Out To Get You, previously released on the 4 CD set Genesis 1967-75. The November issue of the US Guitar Player magazine featured an interview with Ant which covered the different guitars he used on The Geese & The Ghost, Wise After The Event and 1984 as well as Ant's use of unusual tunings. The text of the article is now available on the Guitar Player site. A new Italian language biography of Ant written by Mario Giammetti (editor of the Italian Genesis magazine Dusk) is out now. The Exile is the fourth book in Mario's Genesis Files series - the previously published books in the series have covered the careers of Phil Collins (The Singing Drummer), Steve Hackett (The Defector) and Tony Banks (Man of Spells). 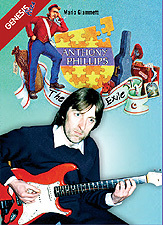 The Exile covers Ant's career in extensive detail and draws upon interviews with Ant himself together with interviews with friends and colleagues including Rupert Hine, Joji Hirota, Peter Cross, Asher Quinn, Guillermo Cazenave, John G. Perry and Ant's brother Robin Phillips. Also included are numerous photographs (many of which have never been seen before), an appendix covering Ant's music for Film and Television written by the webmaster of this site as well as an extensive discography. Ant has also written the preface for the book. NB: The Exile is only available in Italian and there are no plans for an English edition. The recent re-issue of The Geese & The Ghost was selected as one of August's "rants and raves" in Guitar Player magazine. Their review can be seen here. Two recent interviews with Ant are now on line, both of which focus naturally enough on the recent re-issues. The first is an interview with World of Genesis which as well as the re-issues also covers Wildlife and some other interesting areas. The interview can be read here. The second interview is for The Waiting Room and covers in detail how the re-issues were put together. The interview is featured in the latest issue (#68) and can be accessed directly here. The 2 CD re-issue of 1984 is out now. As with the re-issues of The Geese & The Ghost and Wise After The Event, the album has been expertly re-mastered by Simon Heyworth. The extra CD for 1984 includes new mixes from the original 8-track masters which allow parts of the album to be heard for the first time in their original basic form. Also released for the first time is some of Ant's original music for the ATV Series Rule Britannia which was recorded at the same time as the album, the previously unheard keyboard piece Ascension (which was re-discovered on the original multi-track tapes during the research for this re-issue and has been mixed for the first time) and the 16-minute demo version of Poly Piece - a track originally written for inclusion on Sides and then considered by Ant as a possible track for 1984 in the formative stages of the album. Also included are new liner notes detailing the making of the album with contributions from recording engineer Chris David, the writer and presenter of Rule Britannia Dr James Bellini together with Ant's own memories of the album. Many thanks to everyone who has taken the time to contact us with their kind and positive comments on the new re-issues of The Geese & The Ghost and Wise After The Event. Ant is currently busy with work on a big Library music project for Atmosphere Music at the present time. As with the majority of his Library music, this won't be available commercially. Camino Records now have the re-issue of 1984 available for pre-order. As with Wise After the Event, Ant will be signing the first 300 copies of the album that are pre-ordered from them on a first-come, first-served basis. Camino Records now have the re-issue of Wise After The Event available for pre-order. Ant will be signing the first 300 copies of the album that are pre-ordered from them on a first-come, first-served basis. Update: Camino have now announced that the signed copies of Wise After The Event have now sold out. Voiceprint Records have now announced that the planned release date for the re-issue of 1984 is 2nd June. Ant continues to work on further Library music projects for Atmosphere Music at the present time. As with the majority of his Library music, this won't be available commercially. Camino Records now have both the re-issue of The Geese & The Ghost and Wildlife available for order. Ant has signed all copies of both releases that were pre-ordered from them. As Wildlife is due for release one week after the reissue of The Geese & The Ghost, if you order both albums at the same time from Camino then both albums will be sent after Wildlife is released. There may also be a slight delay in despatch depending on the signing but in the words of the chaps at Camino, "As usual, we'll be as quick as we can!" Voiceprint Records have now announced that the planned release date for the re-issue of Wise After The Event is 19th May. The long-awaited release dates for Wildlife (album info) and the re-issue of The Geese & The Ghost have now been announced by Voiceprint Records. The Geese & The Ghost is set for release on 14th April and Wildlife is due to follow a week later on 21st April. The re-issue of Wise After The Event is due for release in May to tie in with the 30th anniversary of the album's original release in 1978. The re-issue of 1984 is then planned to follow in June. Exact dates for these two releases have not yet been announced - when they are we will of course announce them here. Ant is currently working on a further Library music project for Atmosphere Music. As with the majority of his Library music, this won't be available commercially.